Taking advantage of analytics isn’t just for big companies with deep pockets. In fact, midsize businesses are likely more nimble than their larger counterparts when it comes to implementing a plan to tackle big data. Is your company doing what it takes to be among the best at carrying out an effective analytics plan? 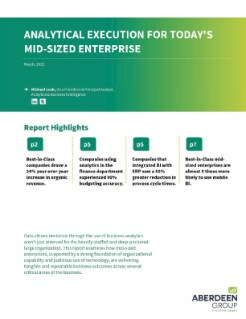 This research report shows how the best-in-class midsize companies when it comes to analytics execution empower nontechnical users with access to BI solutions that create tangible business results like greater revenues and decreased operating costs.